I fancied some oat cakes recently, I have no idea why, I haven’t had an oat cake for years, but sometimes something just takes your fancy doesn’t it? So I decided to look up some recipes and see how to make them myself. There’s many recipes if you search for them, all with their slight variations; I read a few, got the basic idea, and devised my own plan. I have continued foraging for wild garlic this week, in particular for the flowers; the plants are now flowering like mad and I think they’re so very pretty, as well as being tasty. I’ve collected them to use raw in and over dishes, and I’ve dried some in the oven for other experiments, so when I was pondering oat cakes, wild garlic was still very much on my mind. For the first batch I made, above and below, I added crumbled, dried wild garlic flowers to the oat dough, as well as pressing dried flowers into some of them. In the second batch, below, I added some dried and crumbled wild garlic leaves and added some non dried flowers instead to see how they would fare..
Preheat your oven to 160C fan, 180C. Line 1 large or 2 medium baking trays with baking parchment. Put 100g of the oats into a mixing bowl, and the other 100g into a blender and run it to make a fine oat flour. 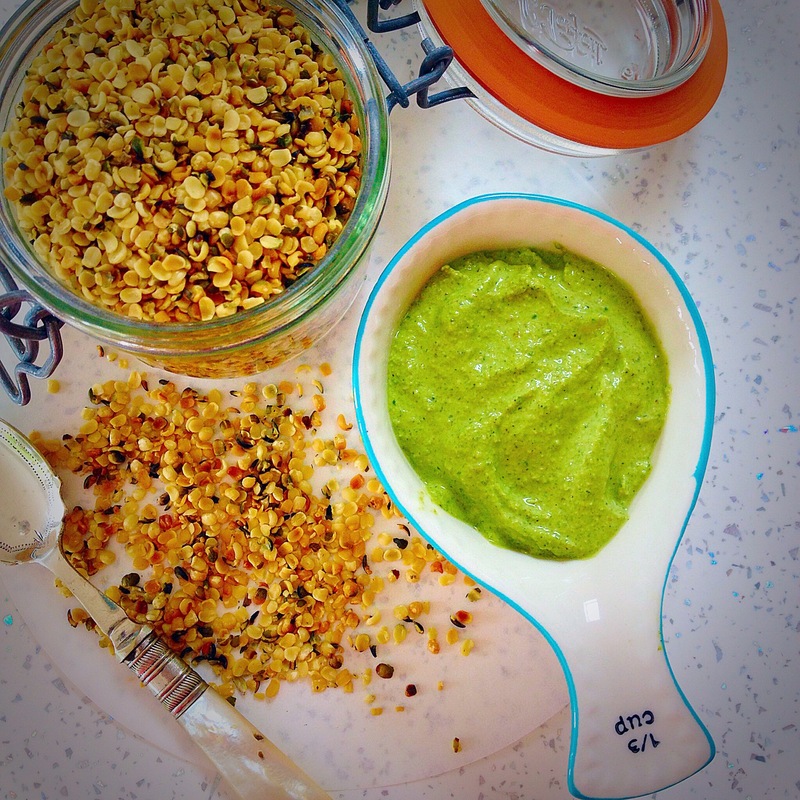 Add the oat flour & salt to the whole oats and add any extra ingredients that you want to add: a handful of seeds, some herbs, spices, chopped nuts…the possibilities are endless. Add 2-3 tablespoons of hot water and start to mix it all into a dough, add extra water as necessary to bring it into a usable dough. Generously flour your work surface and roll the dough out to about 3mm thick. *This is the point at which I pressed the flowers into the oat cakes. Cut out the oat cakes with cookie cutters, I used 6cm and 8cm diameter ones. Use a palette knife or fish slice to lift the cut rounds onto the parchment paper. Bake for 25-30 minutes, turning once halfway through. *The time required to bake them may change depending on how much water you’ve added and what additional ingredients you’ve included. Assess the oat cakes yourself to ensure they are as cooked and crunchy as you want them to be. Allow them to cool to harden further. Enjoy them on their own or adorned with whatever topping you like. Store them in an airtight container. Mine softened after a couple of days but they were still good and the wild garlic flavour worked well. I hope you have fun with some oats cakes! 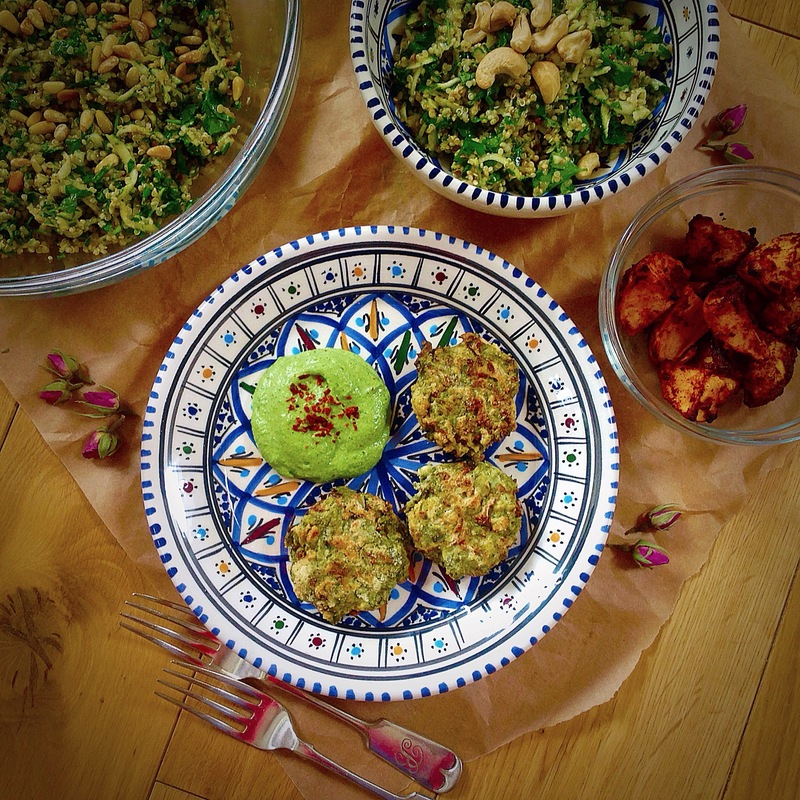 This entry was posted in Crackers, Gluten Free, Healthy, Seeds, Snacks, Sugar Free, Vegan, Vegetarian and tagged cooking, oat cakes, recipes, wild garlic on May 7, 2018 by Elaine @ foodbod. 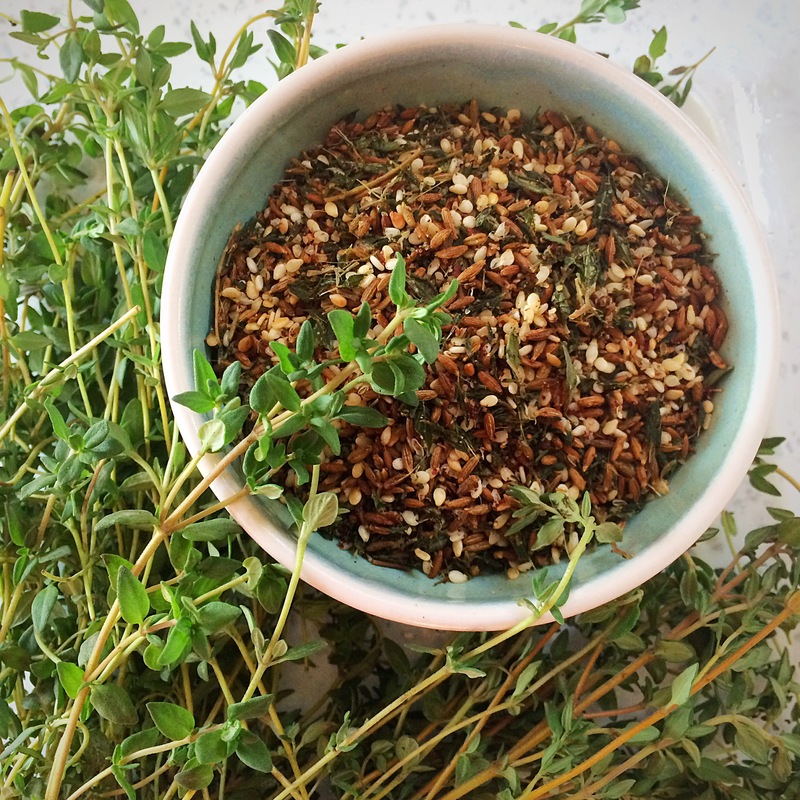 Za’atar can refer to wild thyme or dried thyme alone, or to a herb and spice mix in which thyme is king. 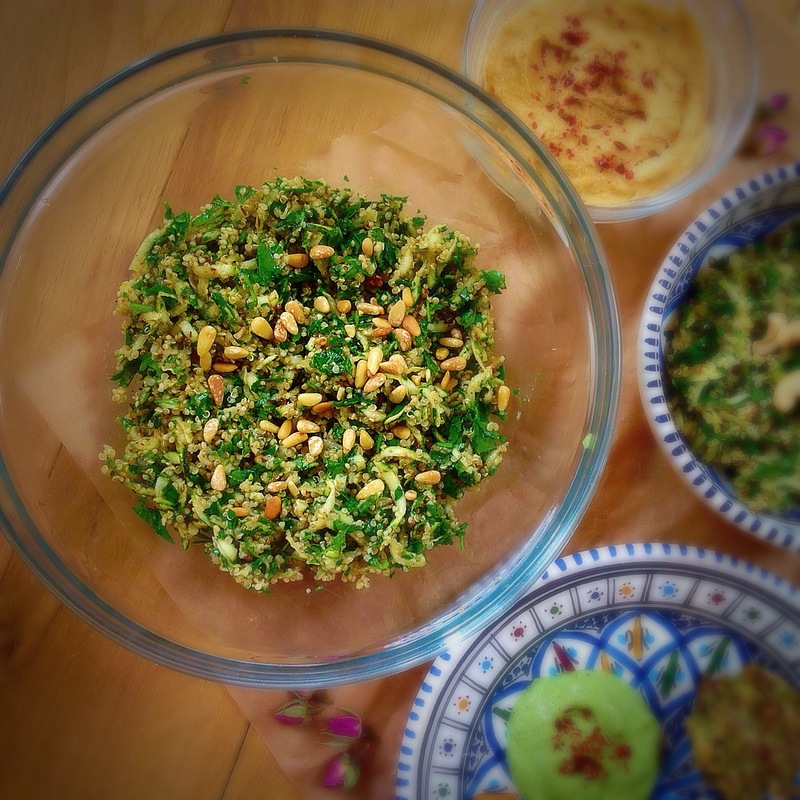 If you read a recipe that states za’atar being required, it can easily require just thyme, but if you use the whole mix, that will work too! 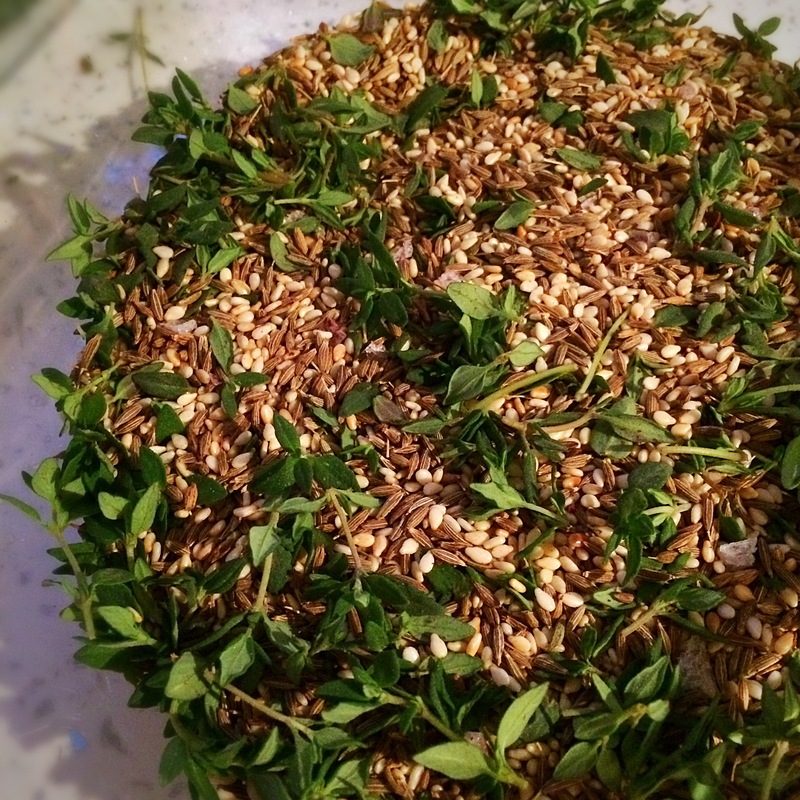 I’ve tried many many versions of za’atar, it is typically traditionally a mix of thyme, sesame seeds, sumac and salt, often including oregano and/or marjoram, sometimes including coriander seeds or cumin seeds…it’s one of those things that every home in Lebanon, Syria, Palestine, all over the Middle East and eastern Mediterranean, will have their own safely guarded version of making. And of course, everyone’s is the best! 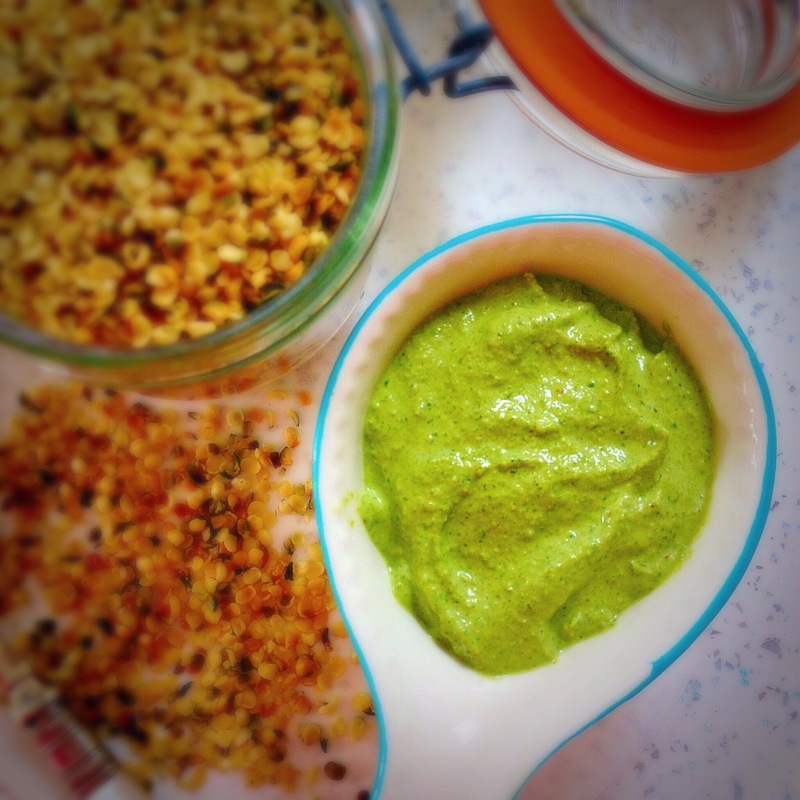 It can be used as a condiment, put on the table next to your salt and pepper, and sprinkled liberally over everything! 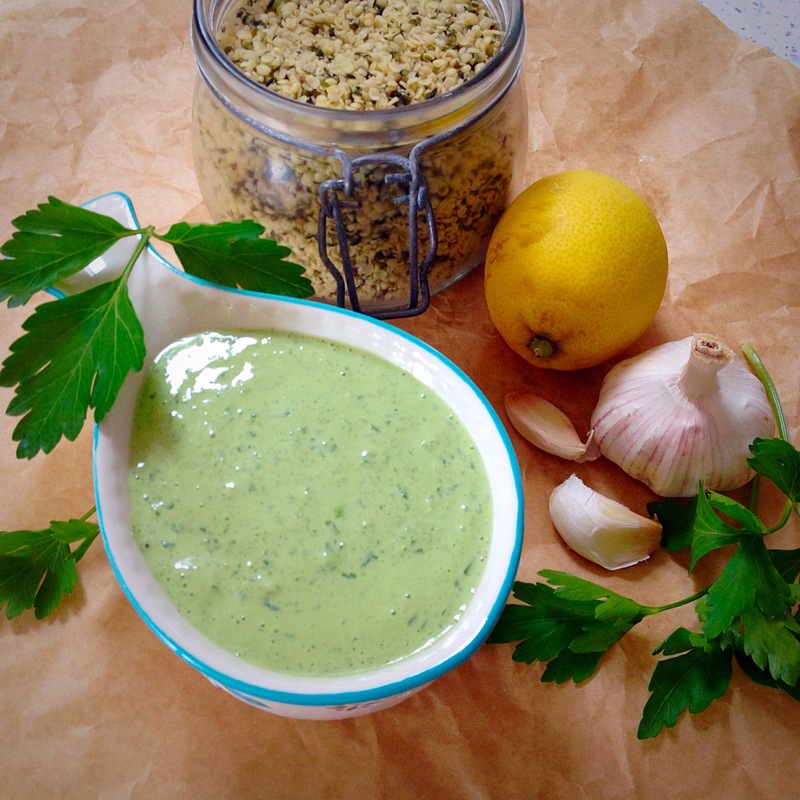 Or mixed with olive oil to create a dip, or spread over flatbreads to make manaeesh. Or added to sandwiches of feta and salad…the possibilities are endless. Za’atar boasts lots of health benefits from its lovely ingredients, and is said to increase your intelligence – what’s not to like?! I haven’t liked all of the various versions I’ve tried, so it was time to make my own and I read a recipe recently including cumin seeds, and having bought fresh thyme at the market, i made it this weekend. So my version includes equal amounts of sesame seeds and cumin seeds, lightly toasted and cooled; a smaller amount of sumac, an even smaller amount of salt, and lots and lots of fresh thyme leave stripped from the stalks. 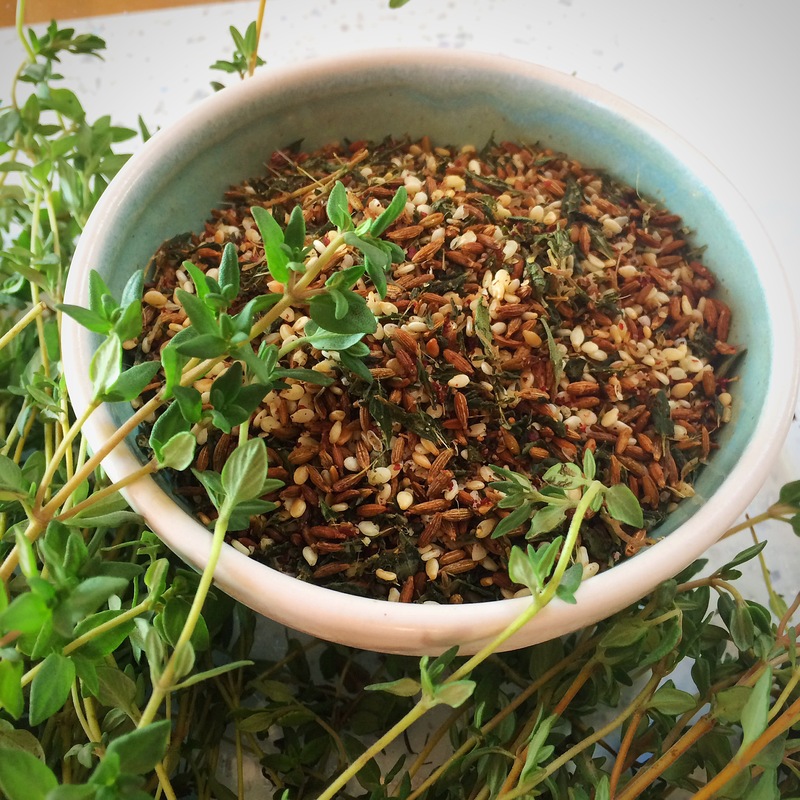 You can chop up the leaves and blend it all in a food processor, but I roughly chopped the thyme by hand and stirred it all together. You can also use dried thyme instead of fresh. You can play around with quantities and what you add or don’t, it’s all about your own taste, I’m really happy with this mix and have been throwing it over everything I’ve eaten since! 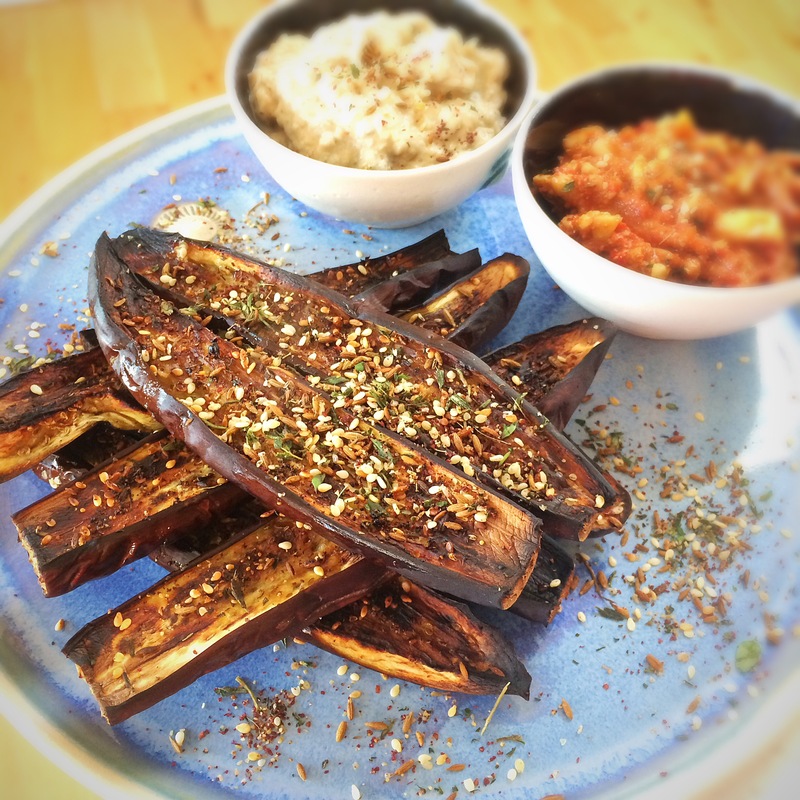 This was yesterday’s lunch, grilled aubergines with za’atar. I added the za’atar for the last couple of minutes only and kept an eye on it, otherwise it would burn. I ate these with some freshly made chunky mutabal and muhammara. 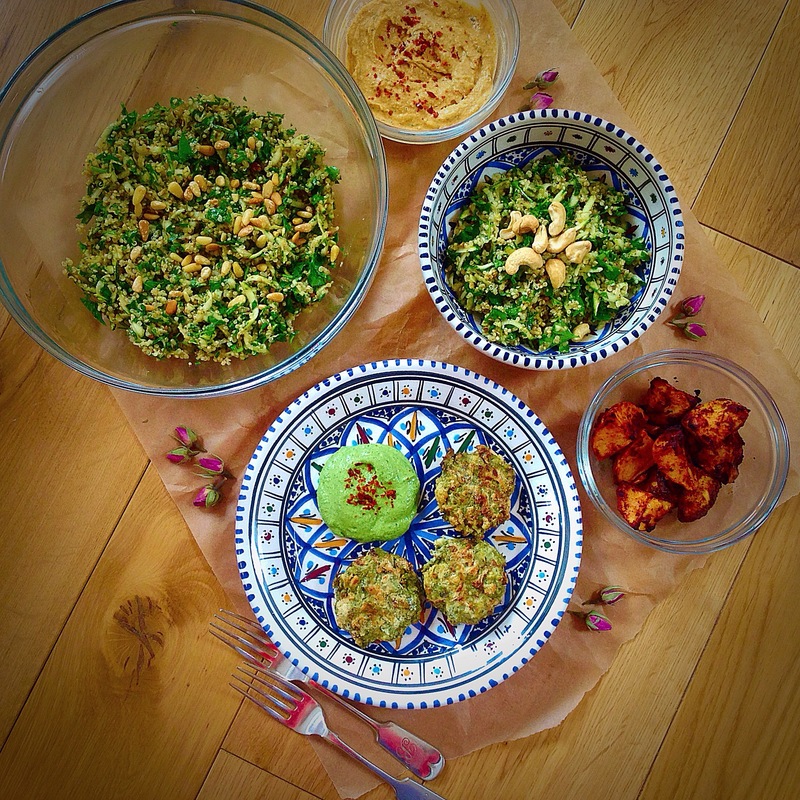 This entry was posted in Gluten Free, Healthy, Mezze, Middle Eastern, Seeds, Sugar Free, Vegan, Vegetarian and tagged cooking, recipes, thyme, za'atar on December 21, 2016 by Elaine @ foodbod. 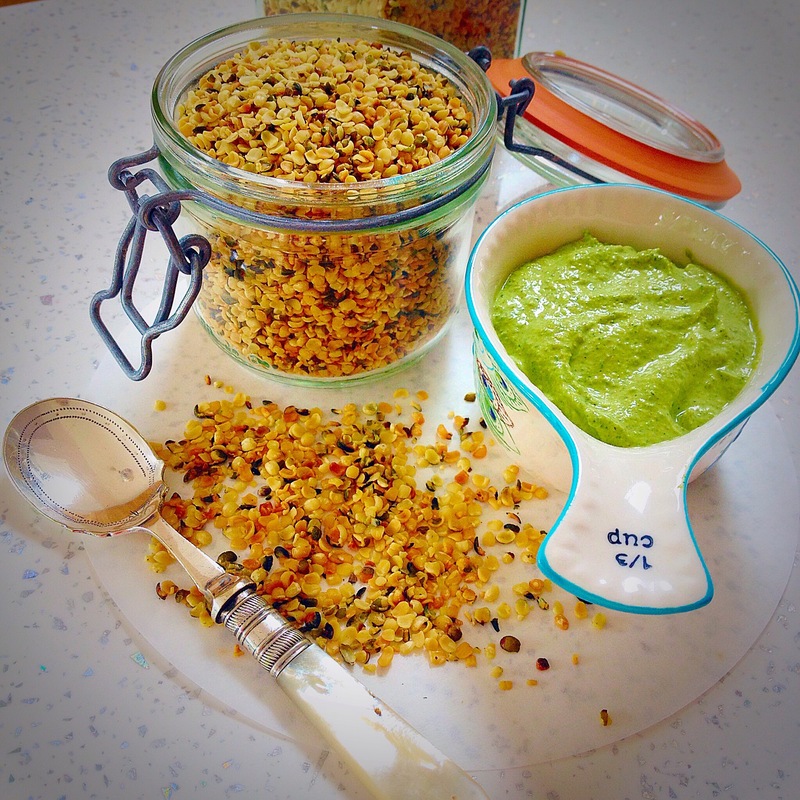 I’ve continued playing with hemp seeds recently…for starters, I’ve been roasting them – like everything, roasting them really enhances the flavour..
As they are such tiny seeds you do have to keep a close eye on them when you roast them, they can very quickly and easily get burnt. I just spread a thin layer on my biggest oven tray and put them in an oven at 200C (180C fan). I take the tray out every few minutes and agitate the seeds, pulling them away from the edges where they get cooked the most first and giving them all a move around. I take them out of the oven for good once they have become a golden brown then leave them to cool before storing in glass jars. 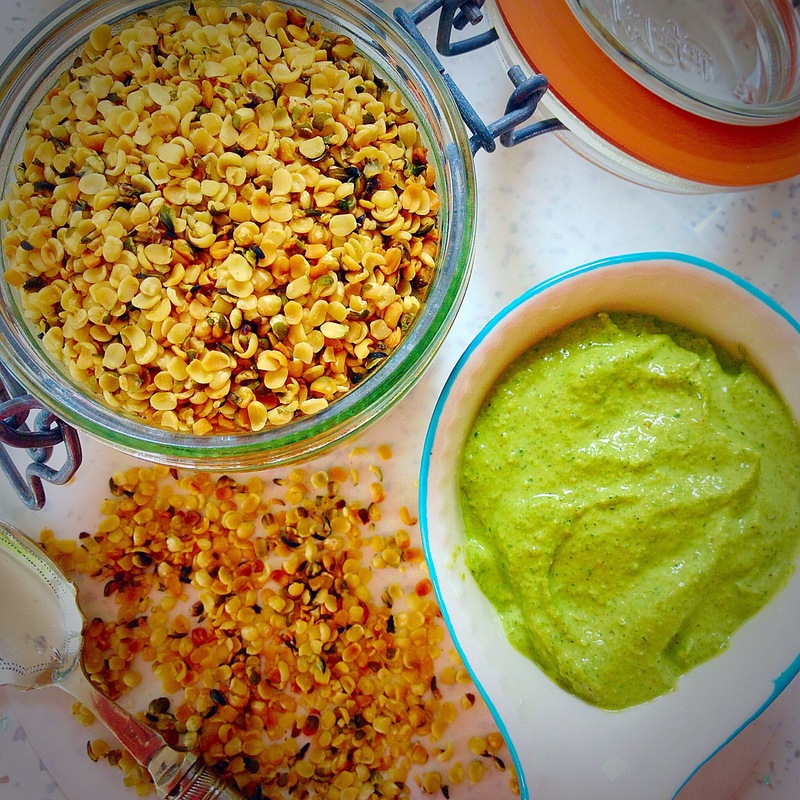 Once again I tried out a new dip with the roasted seeds as well as saving some to throw over salads and vegetable dishes. So this is made of..
1 bunch flat leaf parsley, chopped. All whizzed up in your blender. 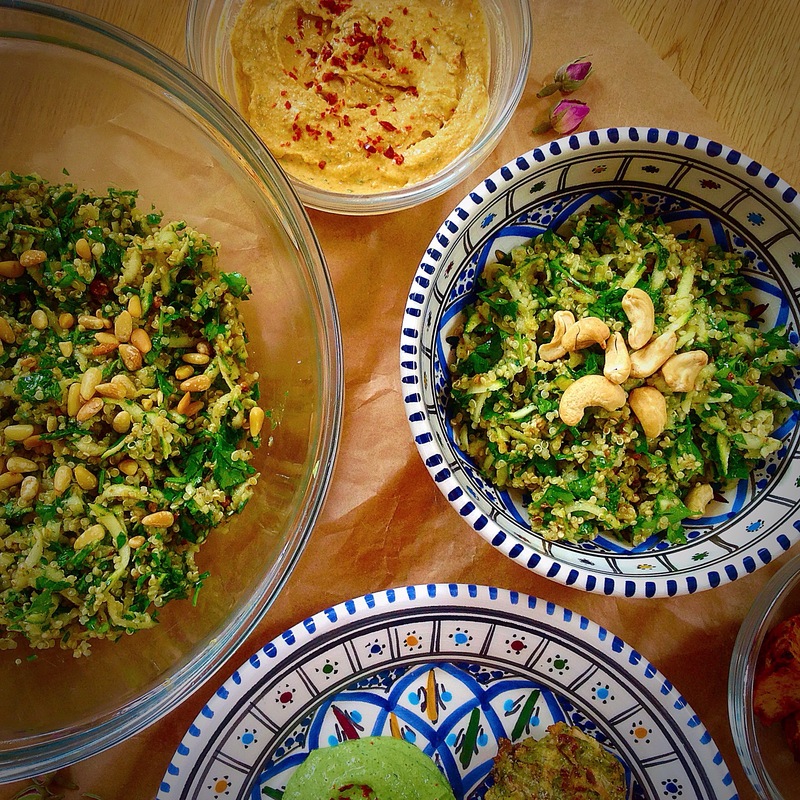 I enjoyed some of this dip with my recent mezze lunch and Selma’s cauliflower and za’atar cakes..tasty, healthy and full of goodness!! 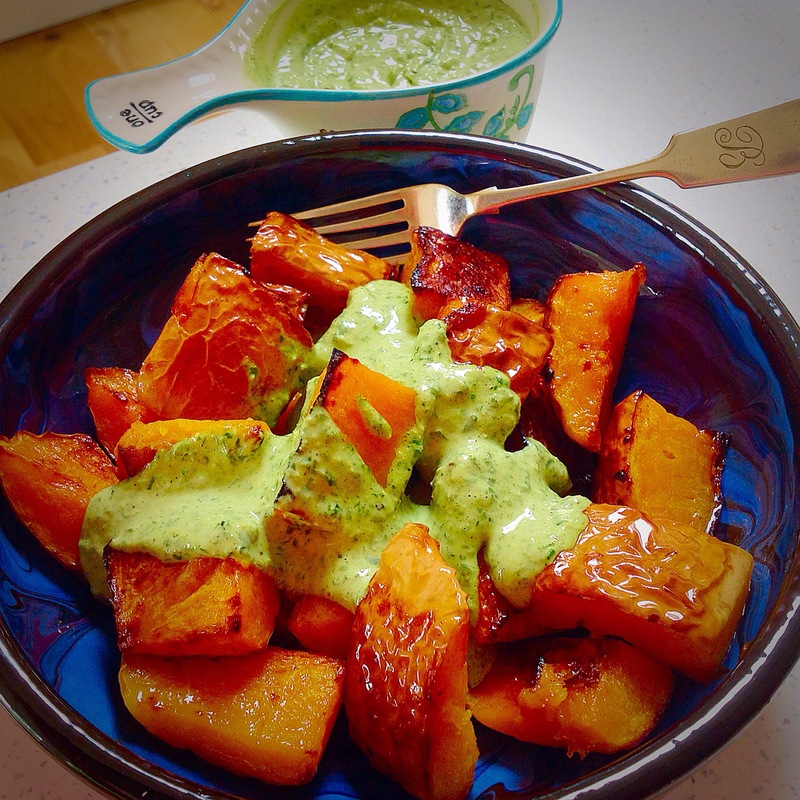 This entry was posted in Dairy Free, Dips, Gluten Free, Healthy, Middle Eastern, Seeds, Sugar Free, Vegan, Vegetarian and tagged cooking, hemp seeds, protein, recipes on August 20, 2015 by Elaine @ foodbod. 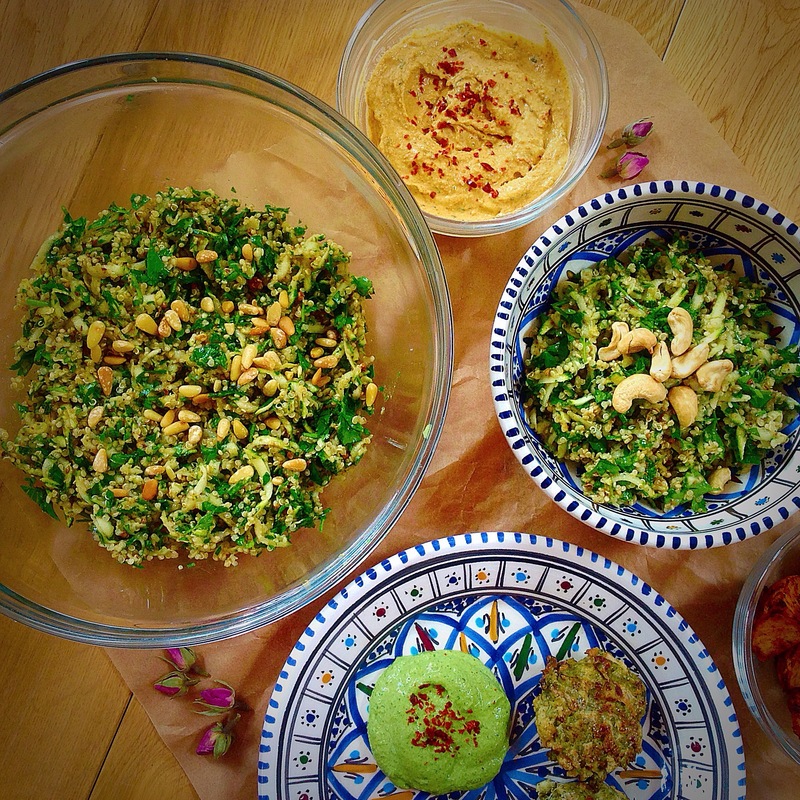 Mezze a la foodbod for Fiesta Friday.. 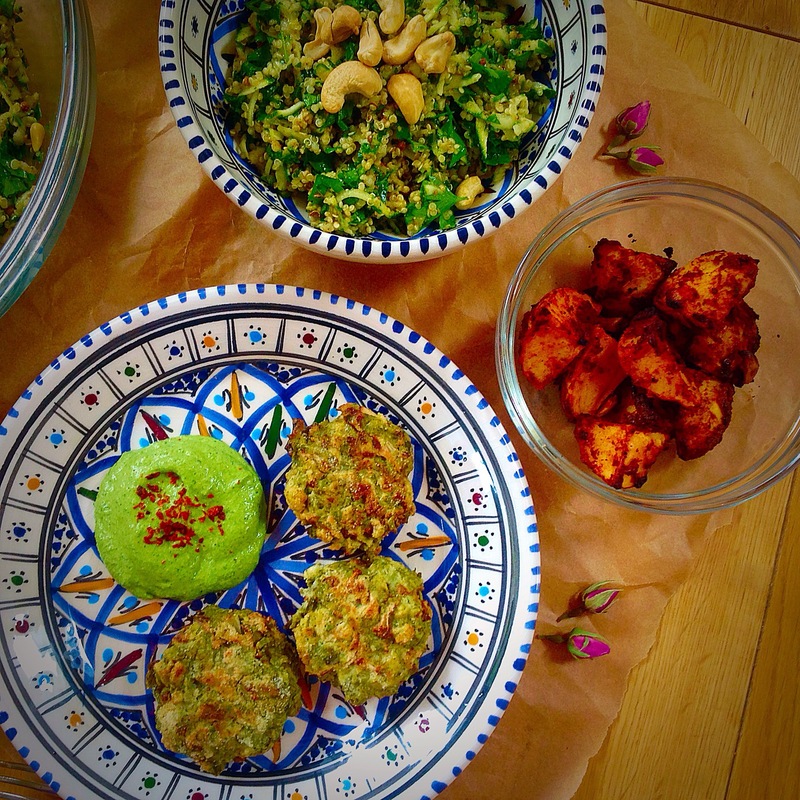 The mezze included the cauliflower, goats cheese and za’atar cakes that I posted earlier plus the following dishes..
A new dip of roasted hemp seeds, lemon juice, water, roasted cumin, ground coriander, garlic, salt & pepper and parsley…more details on a future post. The salad was so fresh and full of goodness, and just as good the next day.. 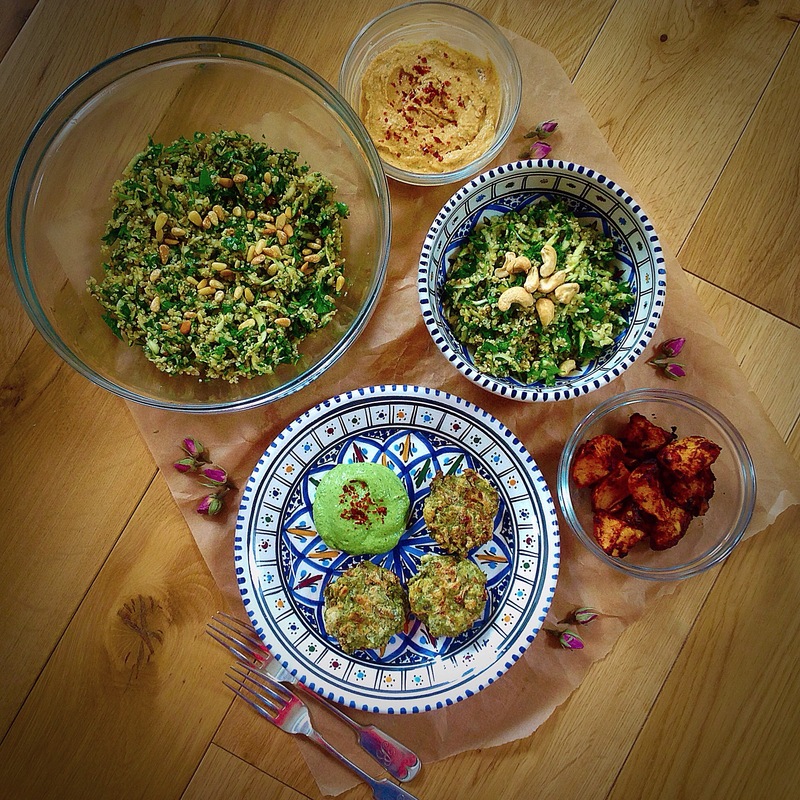 This entry was posted in Dips, Gluten Free, Healthy, Lunch, Mezze, Quinoa, Roasted Vegetables, Salad, Seeds, Sugar Free, Vegan, Vegetarian and tagged cooking, recipes on July 31, 2015 by Elaine @ foodbod. 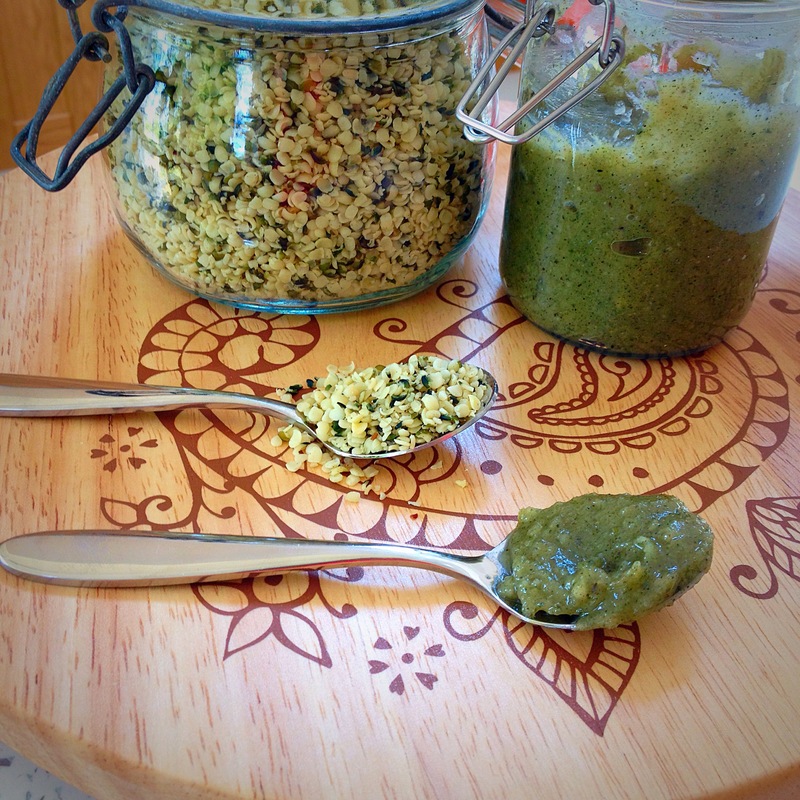 Hemp seed butter and hemp seed & parsley dressing..
Have you ever tried hemp seeds? Forget any association with the cannabis plant, these won’t affect you in any odd ways! 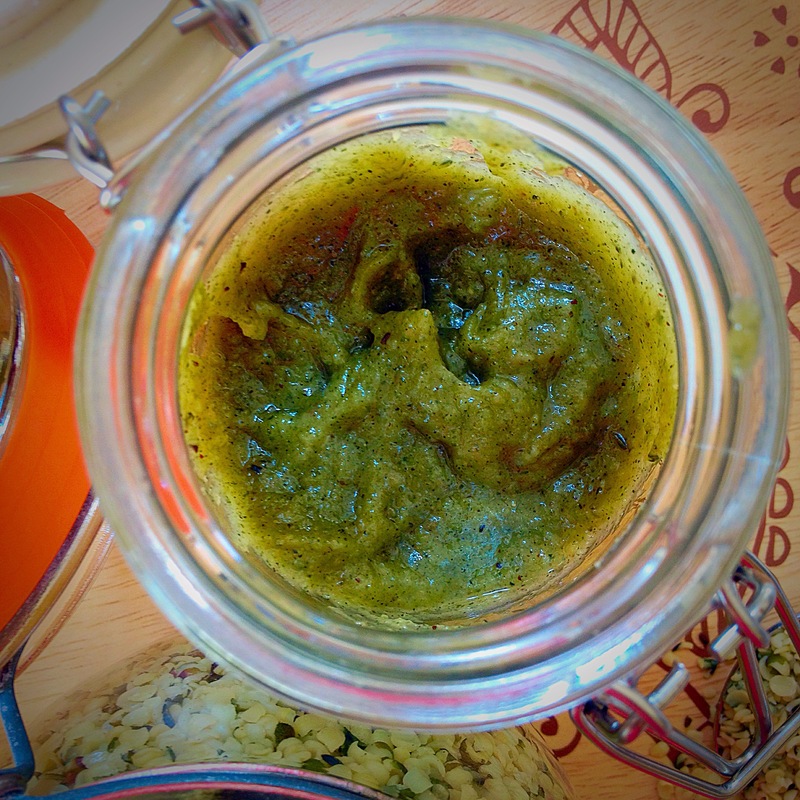 Having bought some recently I started to think about utilising them in new ways so decided to research some ideas for using them, hence making hemp seed butter. I literally threw some in my Nutribullet and whizzed them up to create a butter, akin to any nut butter basically. The Nutribullet makes light work of making any nut or seed butter and these took literally seconds to become a paste; I decided to add some coconut oil to mine for some extra goodness and flavour. The green colour really comes out when you make butter from the seeds. 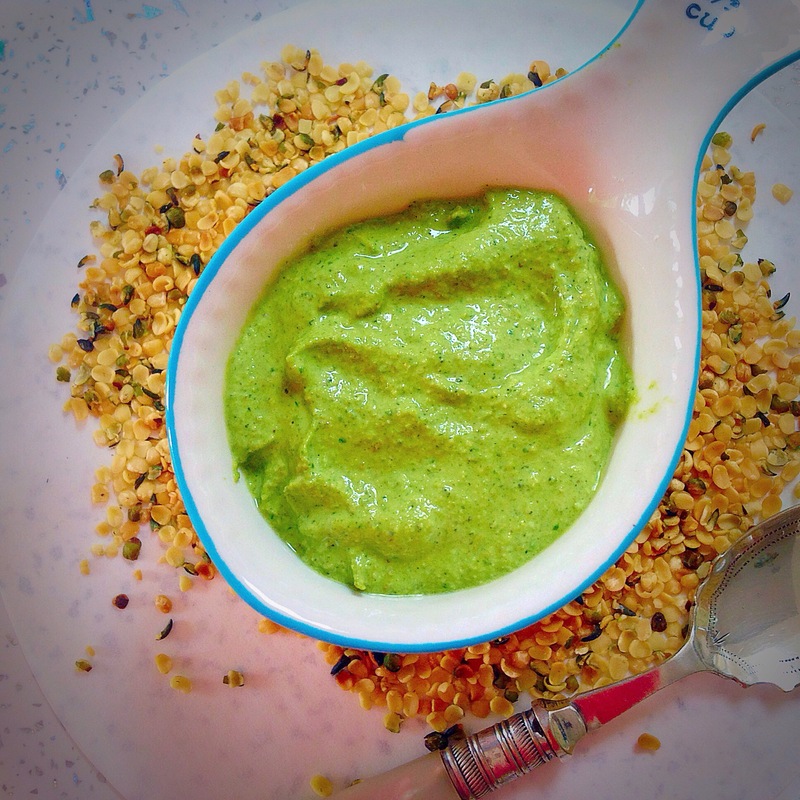 And so my brain continued whirring in the way it does…as tahini is just creamed sesame seeds, these creamed hemp seed could surely be used in a similar way to tahini? So I used it to make a dressing.. 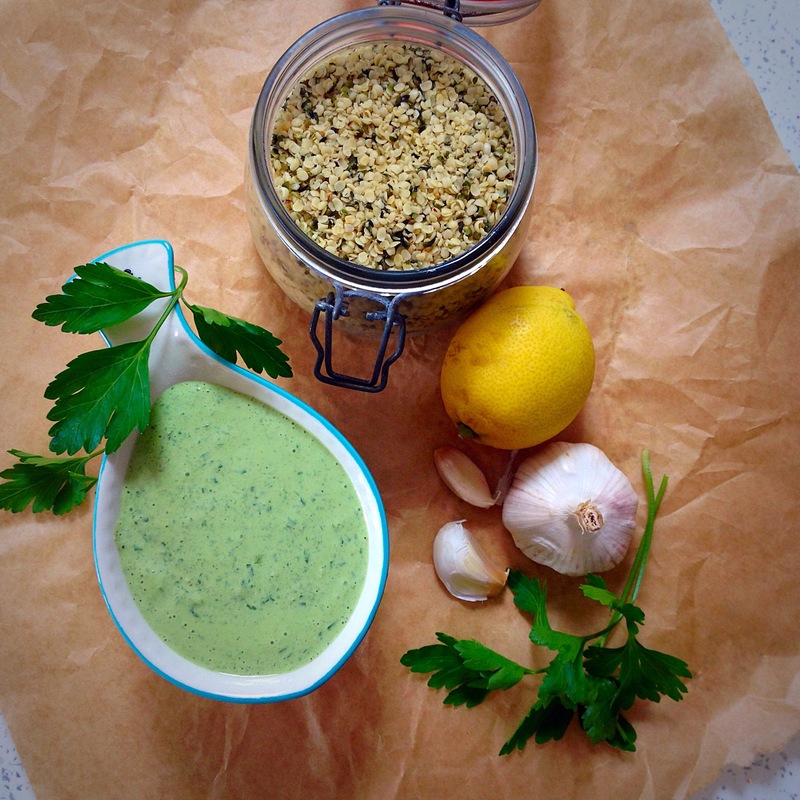 This is literally just some flat leaf parsley, garlic, lemon juice, water and some of the hemp seed butter. The result was really tasty! 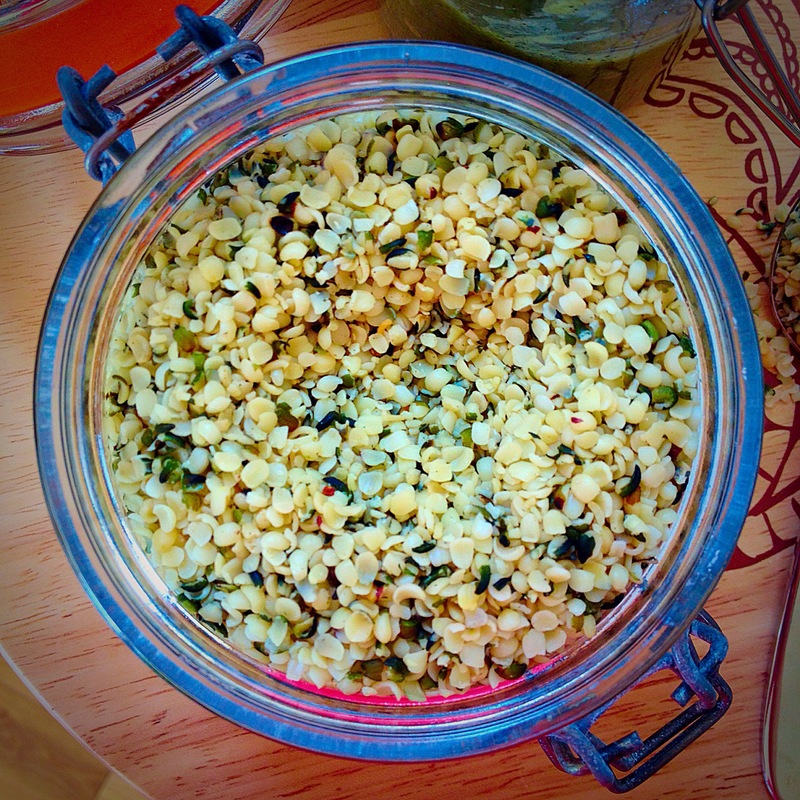 The hemp seeds respond well to being mixed with water and can be used as a non dairy addition to all sorts of things. 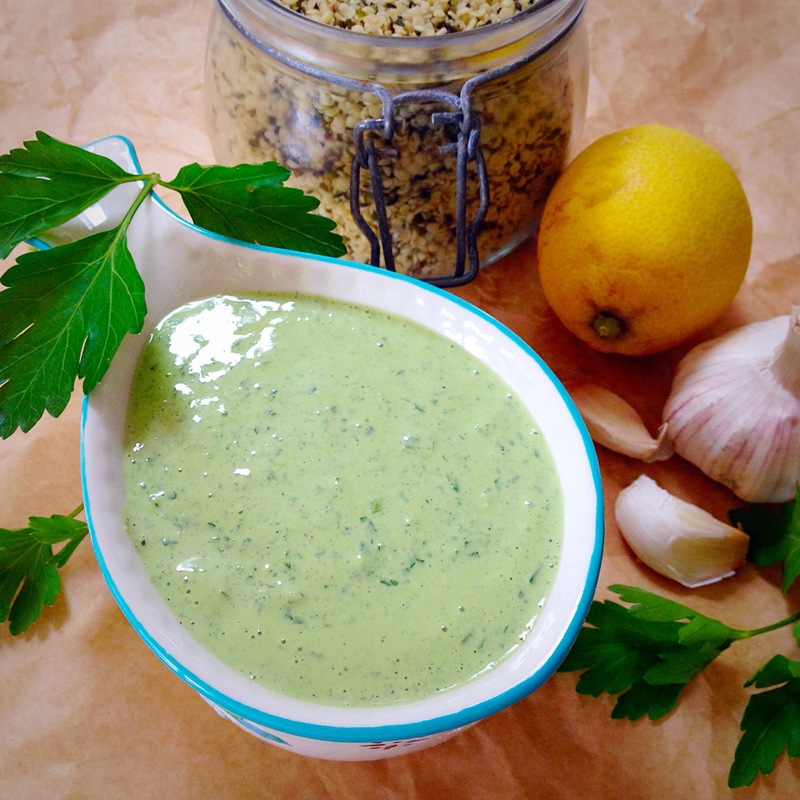 I’ll definitely use it again in dressings and dips. 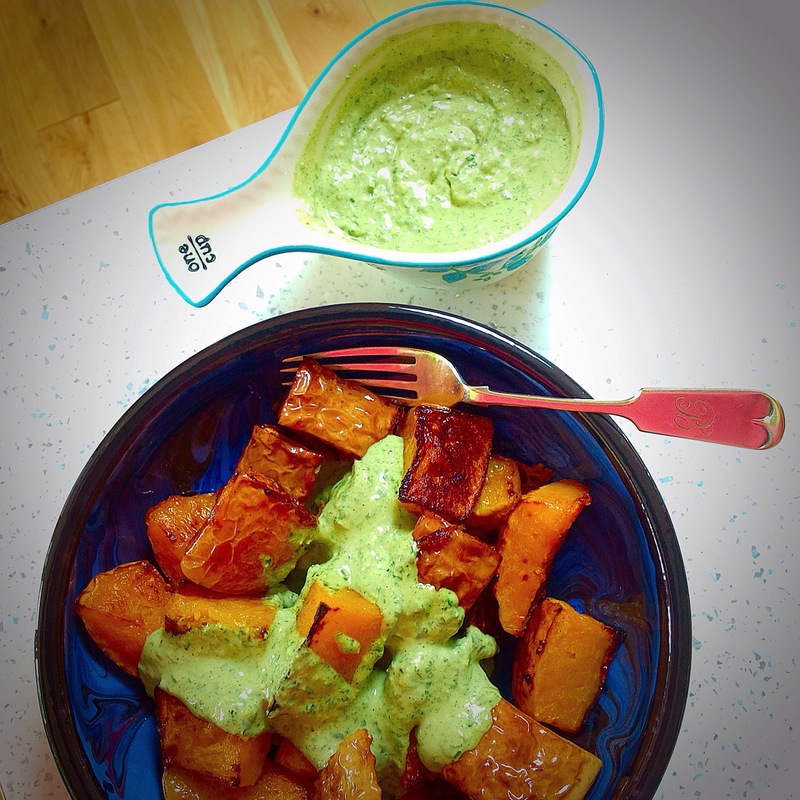 It was perfect over some roasted butternut squash the next day.. 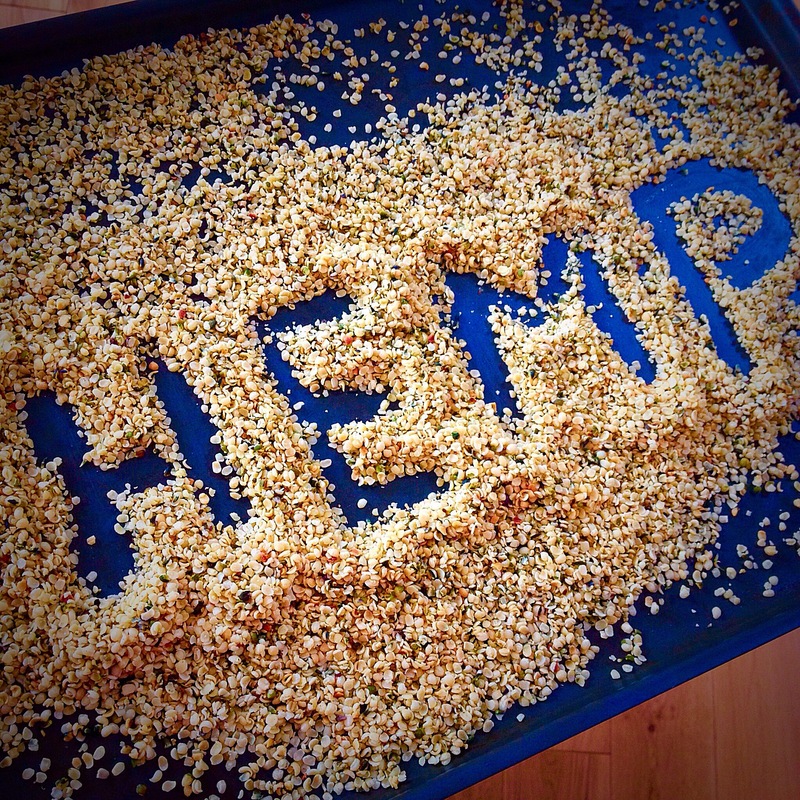 I would definitely suggest giving some hemp seeds a go and check out the different things people have made with them online. If nothing else, just chuck some over your salad or roasted vegetables for some added goodness. 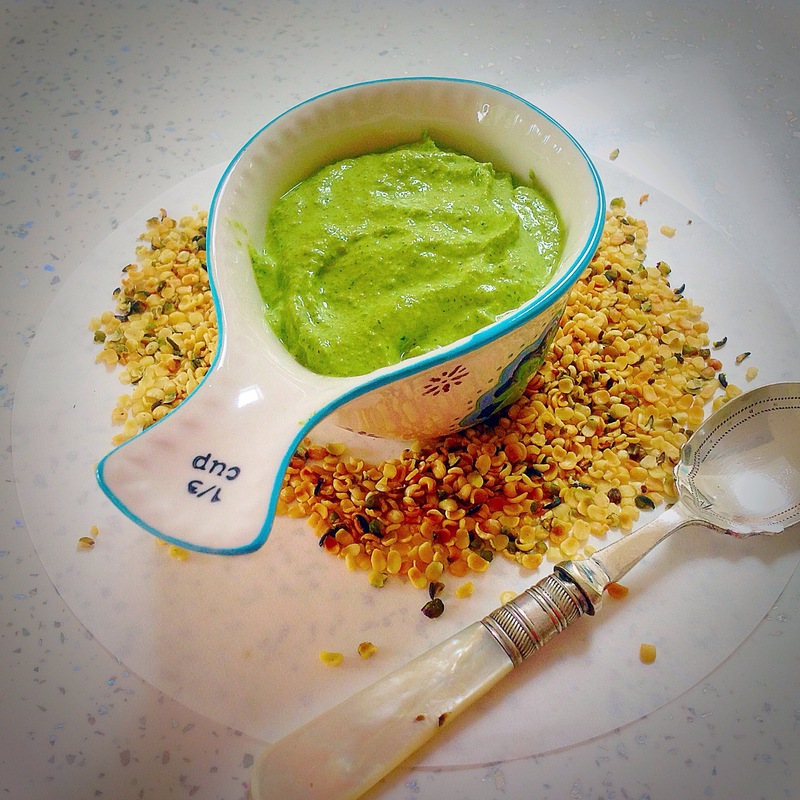 This entry was posted in Butternut squash, Coconut Oil, Dips, Dressings, Gluten Free, Healthy, Seeds, Sugar Free, Vegan, Vegetarian and tagged cooking, hemp seed butter, hemp seeds, recipes on July 19, 2015 by Elaine @ foodbod. 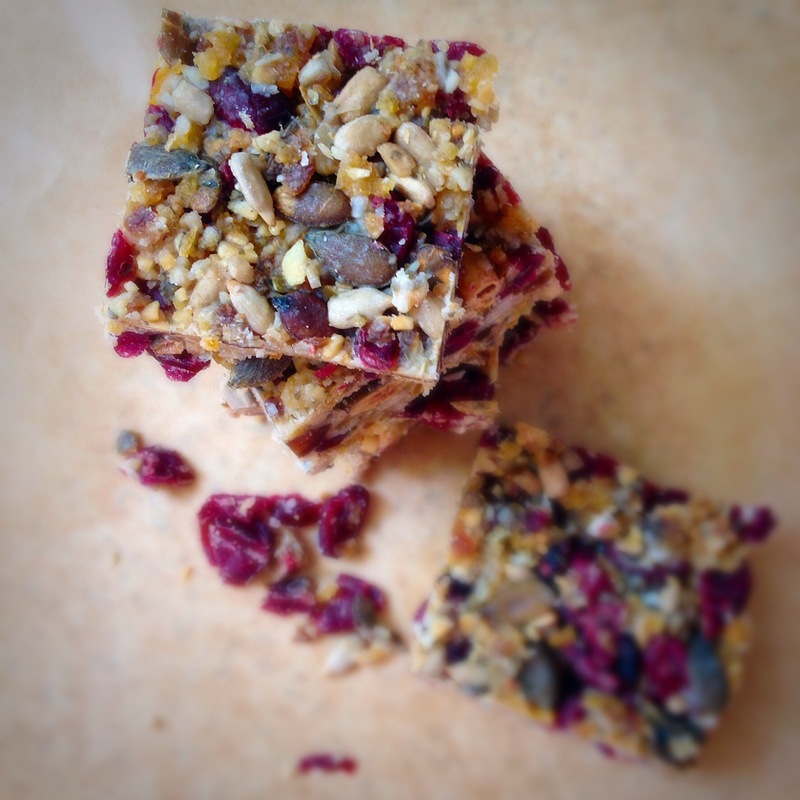 Time for some goodness snacks (and how to make them!).. It’s been a while since I’ve posted any of my goodness goodies, I make different ones every week, but don’t always share them – I don’t want anyone to get bored!!! 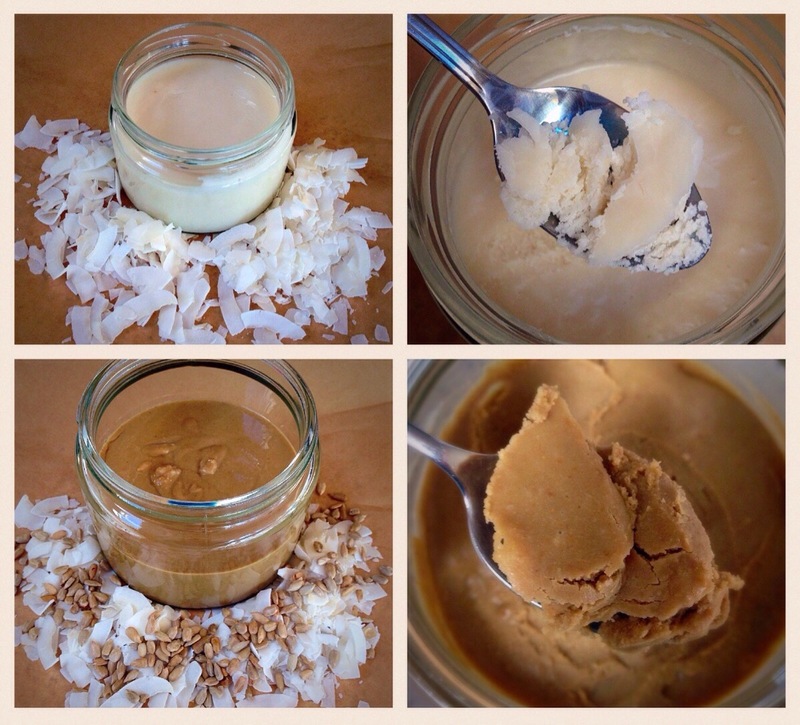 Last week I read two different recipes on two different blogs, one for making your own coconut butter, and one for making your own sunbutter…so that’s what I did, I made them, then used them in some bars. 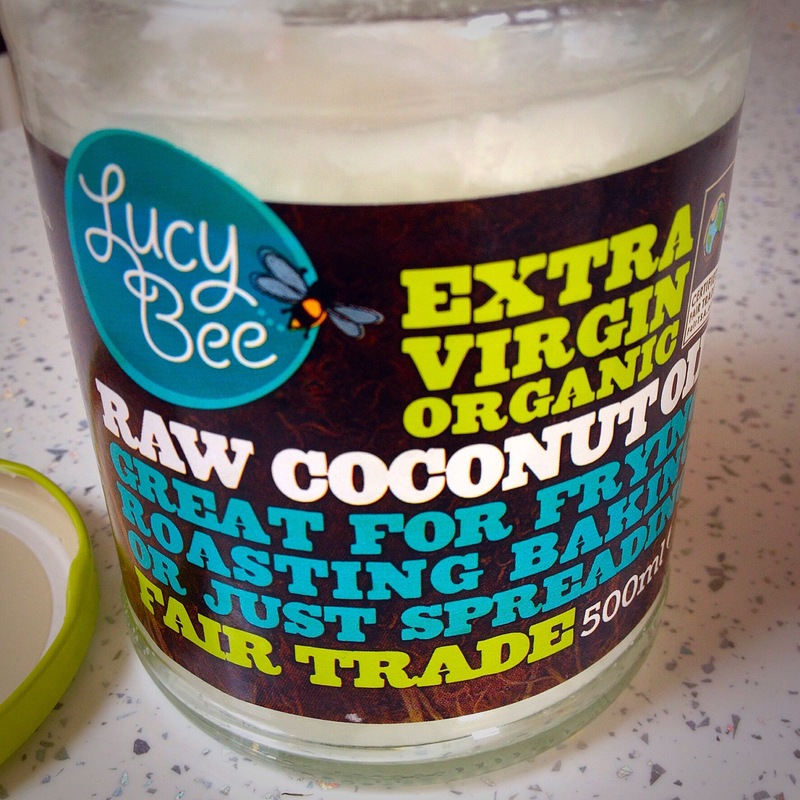 To make coconut butter you literally just throw raw coconut into your nutribullet and whizz it until it becomes liquid. After a while it then solidifies and becomes butter. The same with the sunbutter – whizz up sunflower seeds with coconut oil (I used my newly made coconut butter), it liquefies then sets more solid. 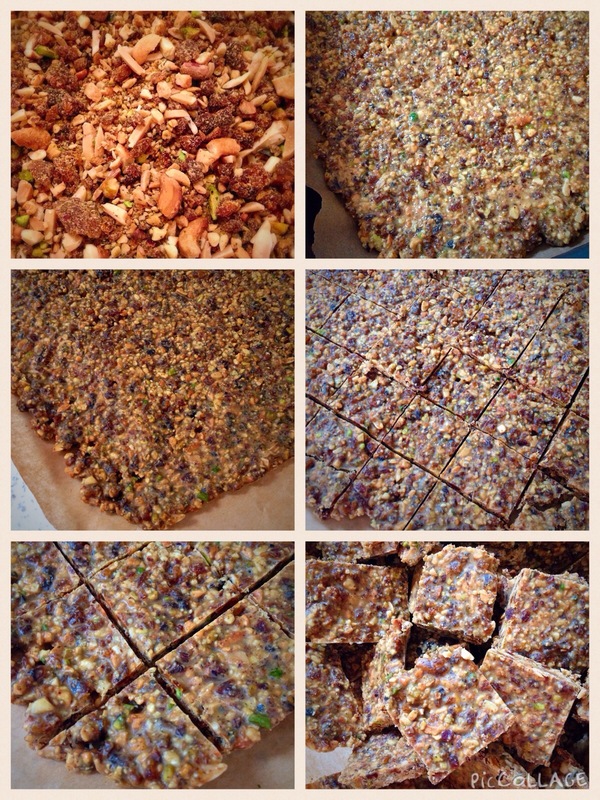 I wanted to make some goodness bars that were nut free, so the sunbutter was perfect for binding the bars. I just threw various seeds and dried fruit into a blender and chopped it all up, mixed it with the liquid sunbutter plus some extra coconut oil, then left it to set. I made some with nuts at the same time.. I also threw together some others with a mixture of unsulphured apricots and mixed nuts, almond butter and coconut oil (more details at the end of this post).. 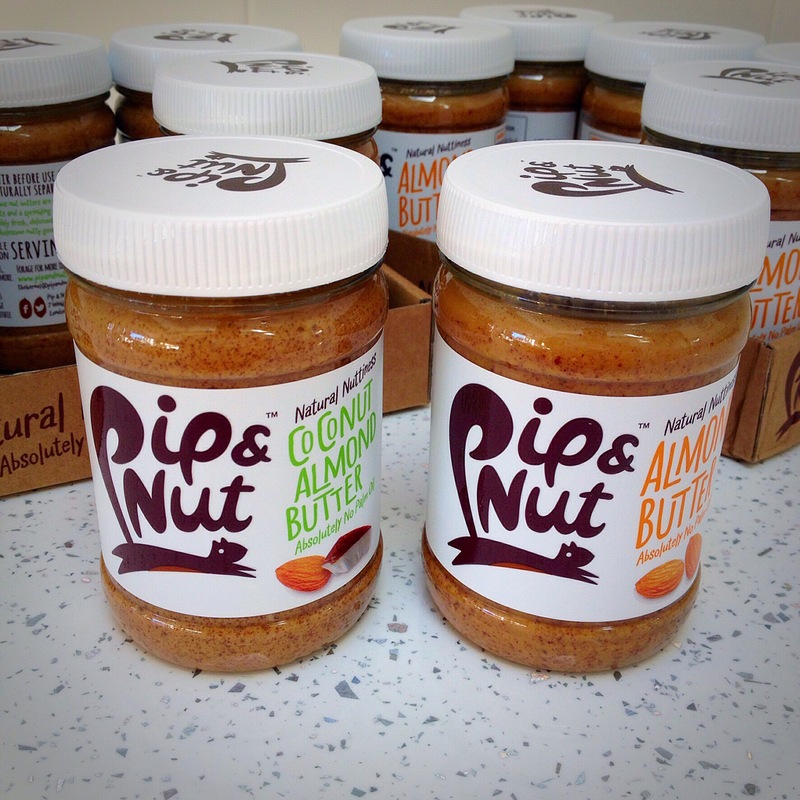 Both very very nice products, and I’ve tried and used many and various nut butters and coconut oils, and I can tell you that these are both rather lovely! (This is my opinion as a consumer, I have not been asked/paid to write this). 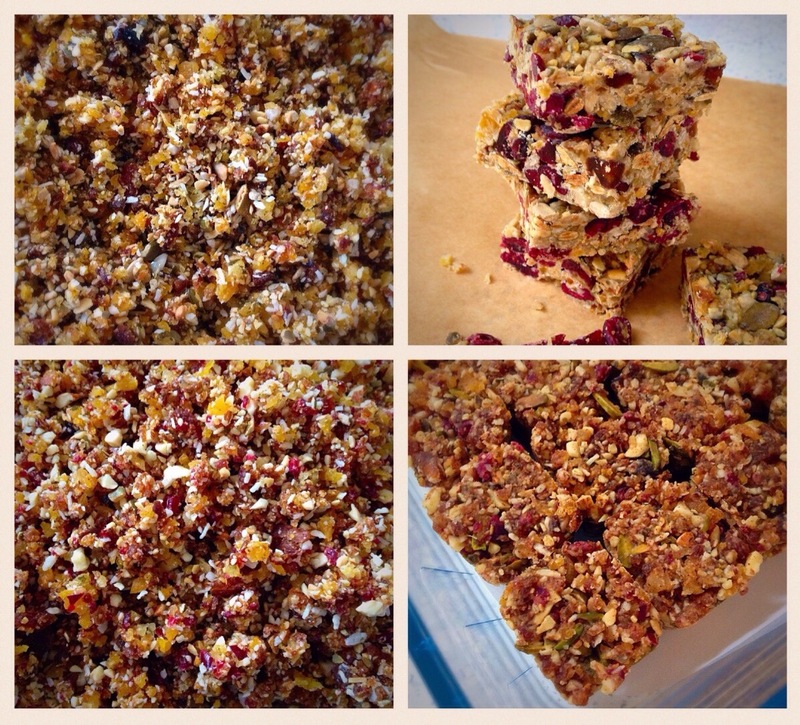 There are lots and lots more versions of my goodness snacks in my recipe index, but to give you the basics of making any of these, here is what I do.. I just chuck whatever dried fruit/nuts/seeds I have or fancy into my small bowl blender and chop them up to a fair sized crumb. Then mix a good couple of tablespoons of nut butter of your choice and coconut oil together and melt them together in the microwave, usually takes 60-90 seconds, then stir this through the mixture, mixing well through the fruit and nuts. You basically want a good coating on everything. I then use a silicone ice cube tray, fill each cube up and press it down with the back of a spoon, then freeze for 30 mins. Press them out and store them in the fridge. 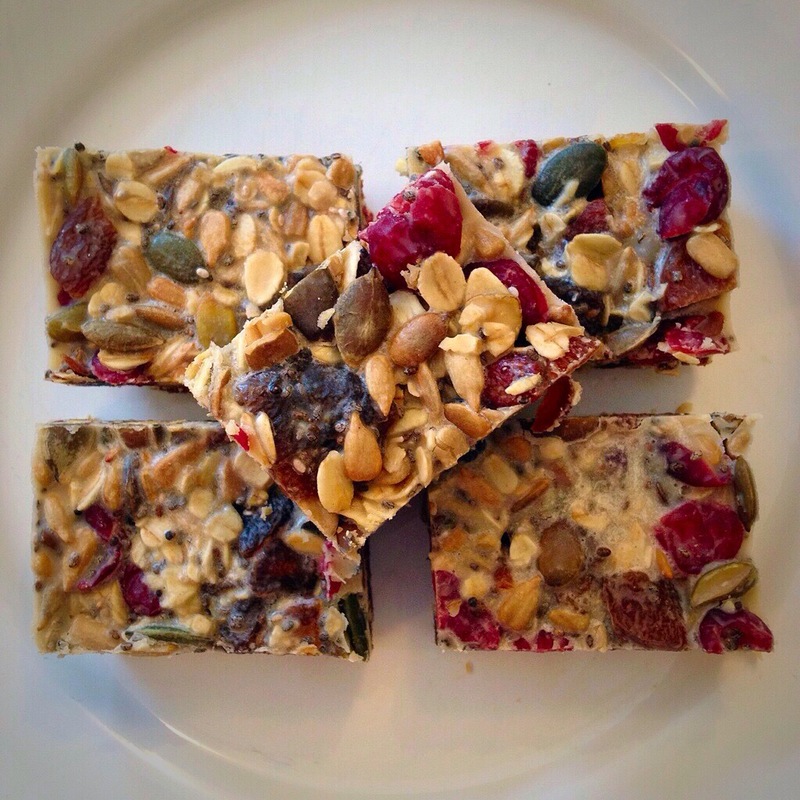 This entry was posted in Breakfast, Coconut Oil, Gluten Free, Goodness bars, No Bake, Nuts, Seeds, Snacks, Sugar Free, Vegan, Vegetarian and tagged cooking, lucy bee coconut oil, pip&nut nut butter, recipes on January 26, 2015 by Elaine @ foodbod.